November’s #RainbowLaces Campaign organized by Stonewall UK to help bring awareness and education toward the issues that LGBTI athletes face in sports was highly successful. Attracting support from professional athletes and sports teams, from all over the world, gay and non-gay alike. Including Sonya DeVille of the WWE, New Zealand Black’s Rugby Team, and the Premier League, including Manchester United. As expected of course, not everybody was onboard. Manchester United alone received more than 43,000 homophobic comments on their social media posts supporting #RainbowLaces. Homophobic comments could be found in just about every post from these organizations, including appearances by the usual tropes “Adam and Eve, not Steve” and blah blah blah. 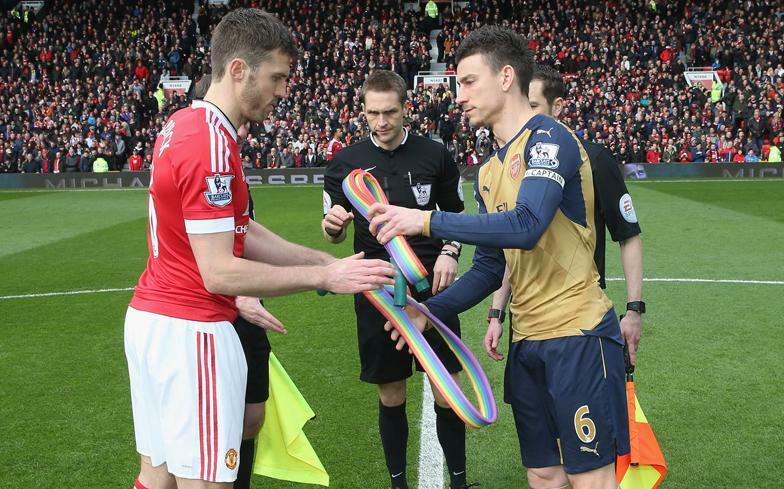 Of course, all this homophobia strongly validates the purpose of #RainbowLaces and why LGBTI support must be visible. Such as the Watford FC’s giant rainbow flag that took over an entire section of their bleachers and the All Blacks swift rainbow jerseys as well as the LGBTI Pride Nights that are happening with a much more frequent consistency. It is clear that there is a lot of work to be done, which is why these campaigns like #RainbowLaces exist. “It’s great to see so many sports associations across the UK proudly championing LGBT equality as part of our Rainbow Laces campaign. The backlash from a small minority online is a reminder of just how vital it is for all of us to do our bit to help make sport everyone’s game. In the end, the message of hate was received and promptly discarded as we continue to move forward.